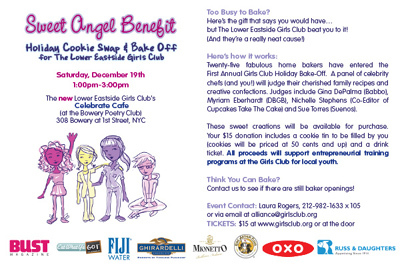 The new Lower Eastside Girls Club's "Celebrate Cafe"
This holiday season we are hosting our first annual cookie swap benefit! It's the perfect way to warm up during your weekend holiday shopping. All proceeds will support job training programs for Lower East Side teens. cocktail shopping party! Delicious gifts will be available for the entire family - near and far. Visit our cookie swap event page for details. the vision to plan - and the tools to build - their future.